With the new year right around the corner, you may be considering some healthy resolutions. It’s easy to blow these in just a few weeks, so let’s start with an easy one—swap out your regular breakfast cereal for this healthy breakfast bowl. Simply put, boxed cereal is no good for you. Even if it’s billed as a healthy breakfast cereal, it’s likely filled with refined flour, corn, corn syrup, artificial colors, and sugar. In fact, there are as many health dangers lurking in a bowl of processed breakfast cereal as there are in a can of soda. It’s time to recognize that colorful cardboard crap for what is: a bad way to start your day. Why not opt for a healthy breakfast “cereal” instead? Here’s what I love to eat: a big, incredible bowl of Blueberry Fiber Starter. It’s perhaps the first of my healthy breakfast recipes that I recommend to anyone looking to reboot their diet. 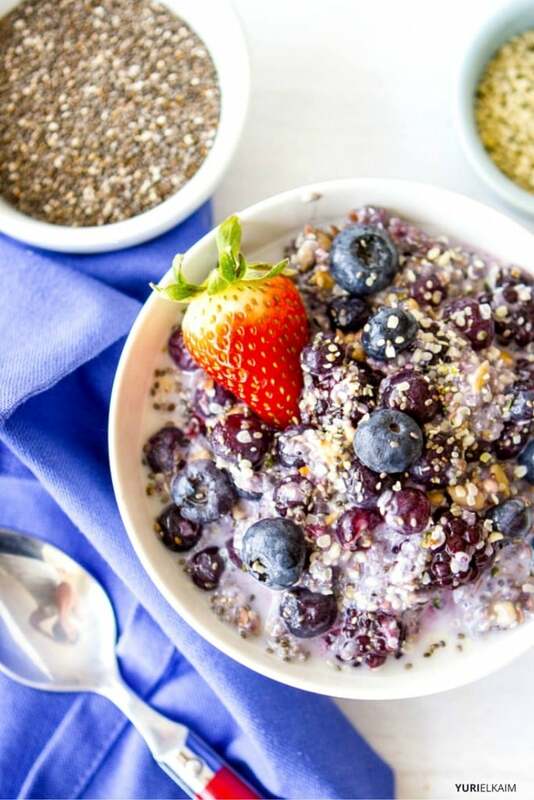 Filled with nourishing nuts and seeds, antioxidant-packed raw berries, and healthy dairy-free nut milk, you can mix together this breakfast bowl as quickly as you can pour a serving of Marshmallow Flakes, only this vibrant breakfast will stay with you all day long. No energy crash, no sugar cravings, no acid-forming gluten to mess with your gut. This recipe makes a great paleo cereal swap, and is also vegan, low-carb, and 100% sugar free. All of these ingredients makes this a deceptively healthy breakfast bowl that is as tasty as it is good for you. With it being wintertime, you can also make this recipe hot. Just add warm almond milk to your bowl, and you’ll have a delicious and filling comfort-food breakfast made quick. 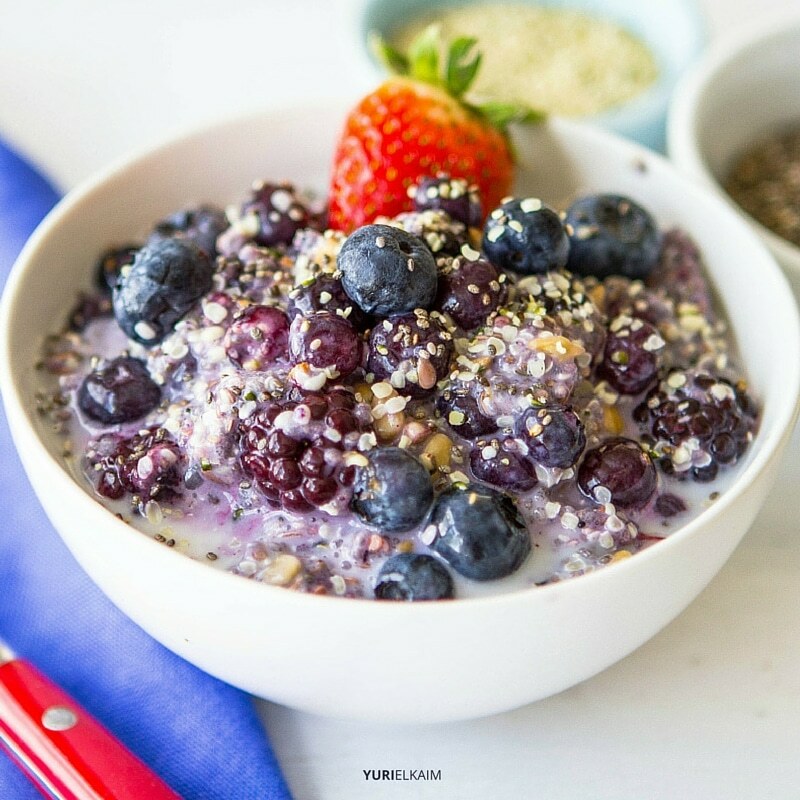 Give this breakfast bowl recipe a shot… I promise you will be satisfied! Swap out that nutrition-deficient cereal for this hearty breakfast bowl of high-fiber, gluten-free goodness. It's a great way to kickstart your energy each morning. Combine the first five ingredients in a bowl. Pour almond milk over the top. Let the bowl sit for 2 to 3 minutes before serving to allow the chia seeds to absorb the liquid and expand.